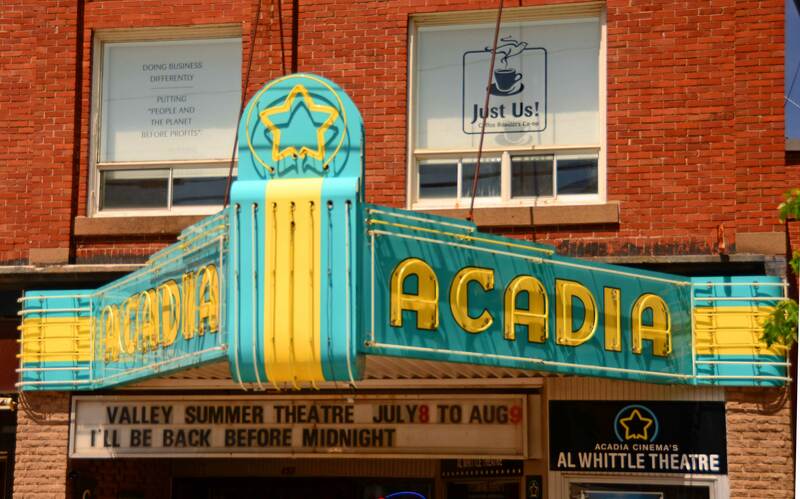 Acadia Theatre’s Classic Neon Splendor! I like vintage signs a great deal, especially classic neon displays that have been well preserved. 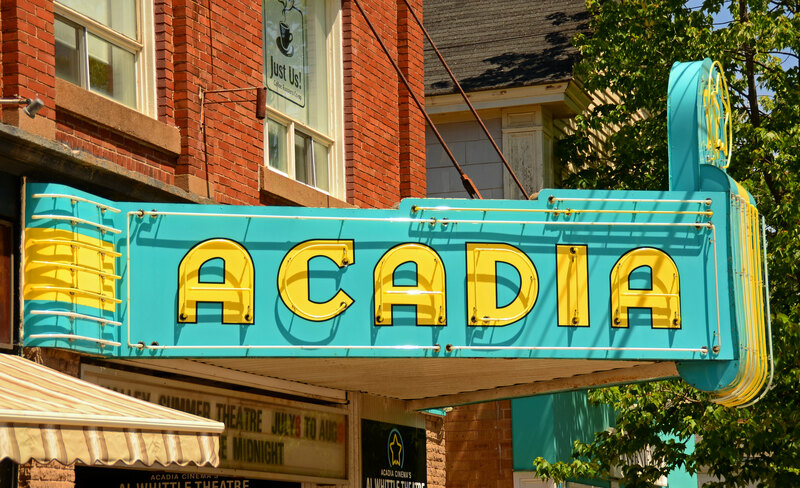 These shots taken yesterday show The Acadia Theatre in Wolfville, Nova Scotia, which is graced with a magnificent masterpiece of neon and signage art above its entryway. 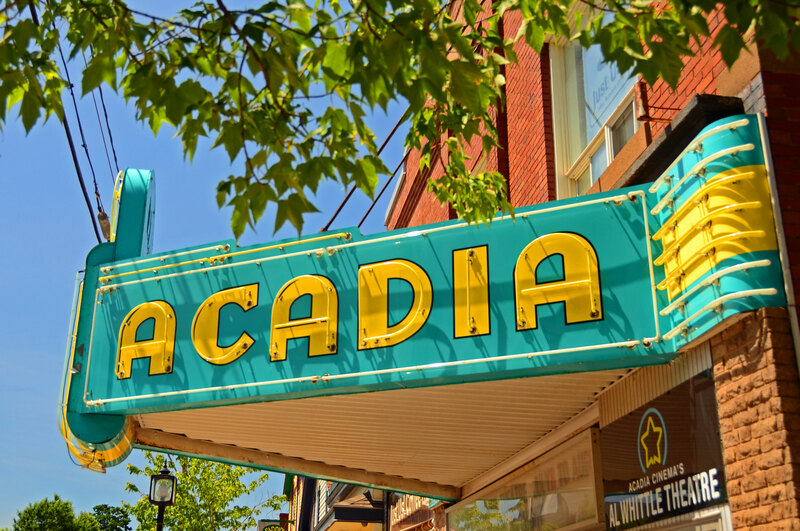 The triangular sign juts out from the building’s facade with “ACADIA” in bright yellow on two sides and white and yellow neon accent lines all around and a bold neon yellow star encircled atop the front. Built in 1911, this Annapolis Valley theatre has been through several incarnations and now houses a cinema and stage for community theatre (the Al Whittle Theatre), a film society (the FundyFilm Society), a local coffee shop / cafe (Just Us!) and an art gallery (Jack’s Gallery). More info can be obtained at the Acadia’s site here. ∗ Love These Vintage Neon and Bulb Signs! I just love it when they keep the sign as a heritage sign. A good eye! Not sure what it’s called but that typeface is distinctive. I think it’s from the 1930s or 40s. Yes, it has that look. I LOVE this theatre! It’s so cheery – and Wolfville is a terrific town. The Deep Roots music festival in September is a highlight! You’re there right now? Hope you’re not getting bucketing rain like we are in Halifax today (I’m visiting too)!! So true, Wolfville has a lot going for it, including this marvelous theatre. I left yesterday so missed the rain. I hope your visit is wonderful! What a treat to see this sign preserved instead of torn down. I love the way you choose themes. Lovely work. I love Wolfville; it’s often the site of our national Quaker gathering. My best memory, though, goes back 3 decades ago – drifting down the nearby Gaspereau River in inner tubes with a couple hundred other party-goers one hot July day when the power company opened the dam. Floating down a river on a summer day — that sounds like a terrific memory! Just arrived in Canada today. Will be here visiting along the Great Lakes for about 10 days! I hope you have a wonderful visit! I enjoy this kind of street photography. Great vintage images and wonderful colors. Elisa, yes, it’s wonderful to find a well-preserved vintage sign holding its own in a contemporary setting. reading your posts is always a treat for me. i like them a lot, they are always very special. your photos are superbe and i like your ideas and thoughts on them. just wanted to let you know. i’m looking forward to your every new post. keep it up! Heike, thanks for your kind comments! I love the colours they used in this sign. It’s really eye catching. This sign is so iconic in our town, and these photos are great. Thanks for highlighting this Wolfville feature!